HTC Vive is making it easier to boldly go where no man has gone before. To go along with the launch of Ubisoft’s Star Trek: Bridge Crew game, the company is offering a special bundle. Starting on May 30, each purchase of an HTC Vive virtual reality headset comes with a free copy of Star Trek: Bridge Crew. Developed specifically for virtual reality, the game puts you in charge of a starship, where every decision you make determines your fate. The game allows for up to four players to command the U.S.S. Ageis as part of a critical mission. All Vive purchases include two motion controllers and two Lighthouse base stations for a complete VR experience in one box. In addition to “Star Trek: Bridge Crew,” Vive purchases currently come with Richie’s Plank Experience, Everest VR, and one free month of a Viveport subscription. To celebrate the new game, HTC is taking over Portal, the all-Vive VR arcade in Seattle. 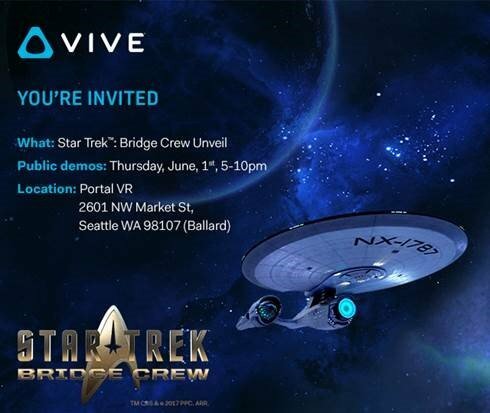 The event takes place on Thursday, June 1 and features demos of Star Trek: Bridge Crew. For more information on the bundle promotion and demos, head over to the HTC Vive Blog.